Foreword: The Himalayas have been revered as the abode of divinity, since the dawn of Indian religious thought. Several venerated pilgrimage sites dot the foothills and the peaks of the Himalayas. The Ganges, revered as a holy river originates in the glaciers in the unsurmountable heights of the mighty Himalayan ranges. Most noteworthy of the Himalayan pilgrimage sites are Badrinath and Kedarnath. Accessible only for six months in a year, Badrinath is reached by a precarious motorable road, while it takes an arduous trek to reach Kedarnath. Also in this pilgrimage route are several other shrines associated with the Indian epics as well as with eminent personalities such as Ved Vyas and Aadi Shankara (such as the Vyas Guh, and the Joshi Mutt). Also in the Himalayas are the Prayags or the sacred confluences of the various rivers that feed the Ganges. In this three part feature on the Himalayas, K. Ram Kumar of Chennai illustrates and covers several of the pilgrimage sites in the Himalayas. Part I features Badrinath alone. Part II will feature Joshi Mutt and several other shrines. Part III will feature Kedarnath. Significance: It is said that "there are many sacred spots of pilgrimage in the heavens, earth and the nether world, but there has been none equal to Badri, nor shall there be". Badrinath is situated in the Tehri-Garhwal hill tracks (Uttarakhand) at the height of 10,248 feet above sea level. This shrine has been visited in the past by religious leaders such as Sankaracharya and is one of the foremost pilgrimage centers revered all over India. Badrinath has been sung in chaste tamil verse by one of the Alwar saints of Tamilnadu (Tirumangaialwar) , in the 8th century CE (and has also been mentioned by Perialwar, as one of the sacred centers of Vishnu) ; is considered to be one of the 108 sacred centers of the Sri Vaishnavite religion. Antiquity: Srimad Bhagvatam has explained the significance of the temple and the glory of Shri Badri Narayan. However the history and origins of the temple have not been well recorded with due authenticity. The Kings of Garhwal built the present structure of the temple about two centuries ago. Certain beliefs consider this image to be that of the Buddha (given the seated posture and the placement of the arms). Local legends say that the original temple was desecrated by Buddhists and the image thrown into Narad Kund, near river Alaknanda, to be retrieved later by Adi Sankara. The image was then restored to its original position and protocols of worship were established. The Temple: The temple, moderate in size, can be divided into three parts  sanctum, the darshan mandap and sabha mandap The temple has suffered from avalanches, several times in the past and renovated. The Kings of Garhwal renovated the present structure almost two centuries ago. The beginning of Guru-Shisya parampara is supposed to have its roots here. This is symbolised by two range of mountains  Nar range of mountains (representing the individual soul - Jeevatma) and Narayan range of mountains (on which side is the temple situated  representing the supreme reality - Paramatma). These forms were used to convey the Ashtakshara mantras, Vedas and their importance. River Alaknanda, considered to be one of the most sacred, divides the two ranges of mountains. 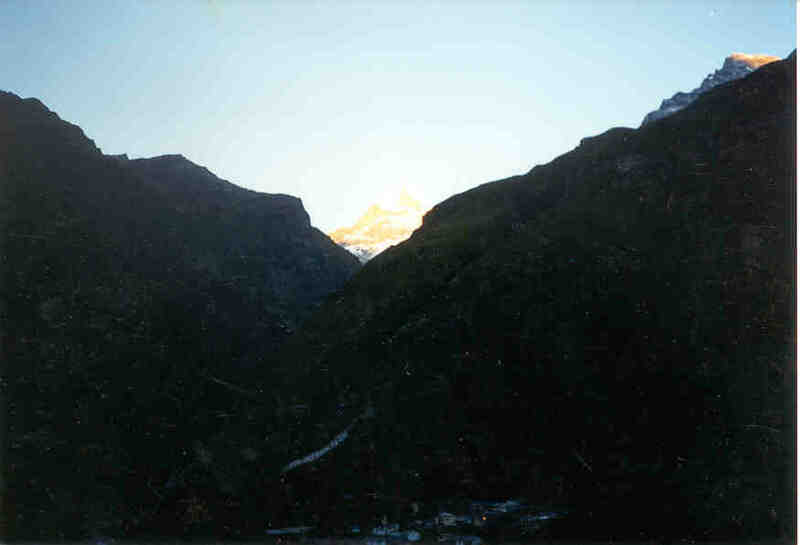 In the backdrop of the temple and Narayan range of mountains is the NeelKant Parvat  ice clad mountain which is a feast to watch in the early morning hours when it sparkles at the time of sunrise (see image above). This majestic peak of Himalayas is of 19800-ft height. Deities: The sanctum here houses Lord Badri Narayan, Kuber ( God of wealth), Narad Rishi, Uthavar, Nar & Narayan. Lord Badri Narayan (also called as Badri Vishal) is armed with Conch (Shankh) and Chakra in two arms in a lifted posture and two more arms rested on the lap in Yogamudra. The principal image is of black stone and it represents Vishnu seated in meditative pose. The temple also houses Garud (Vahana  vehicle of Lord Narayan) and Goddess Mahalaxmi (referred as Arvidavalli Thayar by Tamilians). Also here are the idols of Adi Sankara, Swami Desikan and Shri Ramanujar. Legends associated with this temple: MahaVishnu is believed to have done his penance in this place. Seeing the Lord doing his penance in the open, Goddess Mahalaxmi is believed to have assumed the form of Badri (elandai) tree to provide him shelter to face the onslaught of the weather conditions, hence the name of Badri Narayan. Legend has it that Lord Vishnu identified Nar & Naryan forms to be of his own to Narad Rishi. Narad Rishi did his penance here and is believed to be worshipping these forms of supreme God with the Ashtakshara mantra even now. Temple Schedule: Weather conditions are such that, worship could be offered in this temple only for 6 months (May to early part of November - From tamil month Chittirai to Aippasi). During the winter period, the shrine remains closed (to be opened only on Chritra Pournami  Full moon day of tamil month Chitrai) and during this intervening period it is believed that Divine beings conduct poojas to Lord Vishnu. In accordance with established Hindu rituals of conducting poojas without any break, the Utsavars (bronze images) are taken with all reverence to Pandukeshvar - abode for Lord Badri Vishal during winter. On the day of reopening of the main shrine at Badri, these images are taken back. Rituals offerings to pitrus (souls of the dead) are performed at Brahma Kapaalam (located at a distance of 200ft from the main shrine) on the banks of Alaknanda, by offering prasad (rice food) of Lord Badri Narayan. Though this shrine is located in the northern most part of India, the Chief Priest Ravaljiof Keralite (Namboodri) origins - performs the rituals. Procedures of daily poojas and rituals are supposed to have been prescribed by Adi Sankara. Unlike in most of the Hindu temples all the poojas (including decoration of idols) are performed before the eyes of all devotees. The temple opens at 7 am each day. The following is a list of the various worship services offered here, each day..
Nimalya Darshan : Chandan (sandalwood paste) left on the image of Badrinarayan from the previous night, is removed to enable devotees to have full view of the image. Abhishek Darshan : Process begins with Kalsa Pooja. Abishekam (ablution) is then carried out in the presence of pilgrims. Alankar Darshan : After abhishekam, the decoration process begins in the full view of devotees. Firstly, the entire idol, excluding the face, is covered with sandal paste and followed by the decoration with flowers & jewels. Aarti Darshan : On completion of alankars, aarthi ( lighting of camphor) is held. This marks the completion of forenoon pooja rituals and will end around 11.30 am  12.00 p.m., after which the temple is closed. Reopening of the temple takes place at 4.00 p.m. for commencement of evening rituals which lasts till 8.00 p.m. During this period, Ashotothram and Sahasranamam recitations take place. Around 7.30 p.m. Mangal aarthi  called as Geetgovind takes place. On completion of aarti, the Chief Priest removes the flowers & jewels in the full glimpse of devotees. The image of Badrinarayan is now left only with sandal paste, to be removed only the next morning and distributed as prasad. Hotwater Springs: The pilgrimage centre boasts of two natural hotwater springs  Tapt Kund and Surya Kund. The sulphurous waters have a temperature of 55* C. A bath in these springs is believed to purify the body and soul and is done before visiting the temple. Vishaal Badri : Refers to the main Shri Badri Narayan Temple and is considered to be the most sacred. Yogadhyan Badri: Located at a distance of 24 kms from Badri Nath and at 20 kms from Joshimath. This is also the place where Maharaj Pandu (father of the Pandava princes) prayed to Pandukeshwar. Bhavishya Badri : This is located at 17 kms from Joshimath and is a small village. 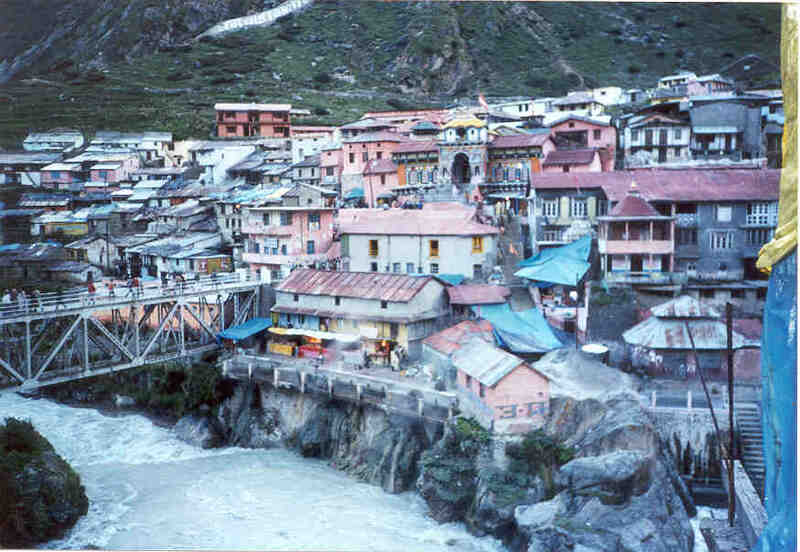 Preeta Badri : Located at 17 kms from Joshimath at place called Animath. 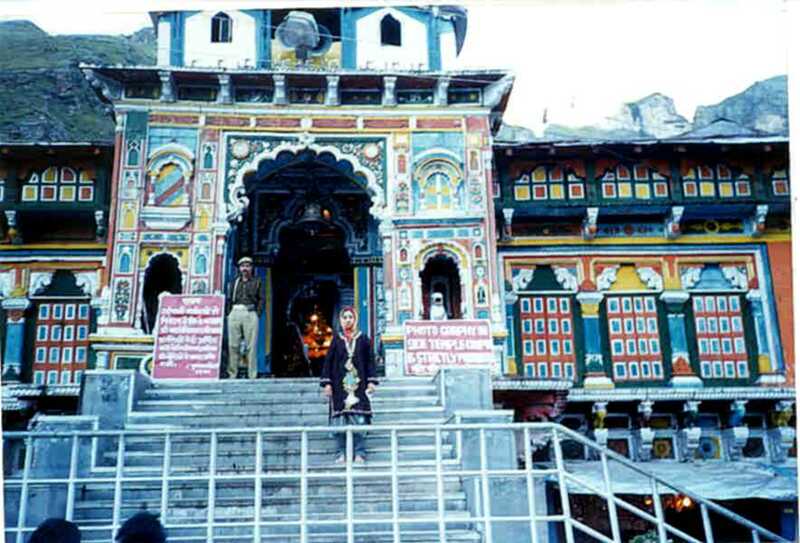 Adi Sankara is believed to have worshipped Lord Badri Nath for some time. Aadi Badri : This is located at a distance of 16 kms from KarnaPrayag. Several temples constructed during Gupta Dynasty are here of which Mana Narayanan temple is considered to be the most popular one. The journey to Badri, mostly from Rishikesh, is through Rudra Prayag. The road from Rudra Prayag is a single way route, passing through mountainous ranges, with the entire route fraught with dangerous curves and stone falling zones. Throughout the entire route, one one side is the River Alaknanda and on the other - lofty mountains. Innumerable milky water falls add to the scenic beauty of the entire route. During rainy days, the route witnesses many landslides. 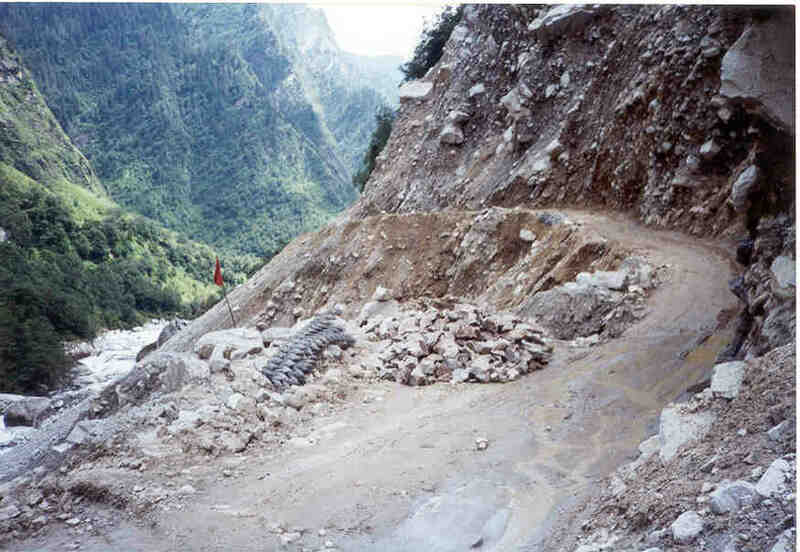 On account of the vicinity to the international borders and risks of landslide in the entire route, the task of maintenance of the road has been entrusted to Border Roads Organisation (BRO), a Unit attached to Indian Army. The distance from Rudraprayag to Badri is 160 kms. Travel time will be dependent on weather conditions and landslides enroute. Badrinath is also connected by road to Dehradun, Haridwar, Pauri, Uttarkashi, Nainital and Almora districts in UP Hills. Some of the major road distances are: Rishikesh  297 kms, Joshimath  42 kms, Haridwar  321 kms, Karnaprayag 123 kms, Rudraprayag  155 kms, Deoprayag  225 kms, Dehradun  343 kms. Nearest airport - Jolly Grant AirStrip ,is located at Dehradun, which is 315 kms away. The nearest railhead is at Rishikesh, which is at a distance of 292 kms. The shrine is open between April and November. Trips during rainy days are not desirable and are to be avoided. One should, without fail, carry Sweaters, woollen clothing, umbrellas and an emergency supply of medicines during the trip. Minimum luggage is preferred. Only vegetarian food and non-alcoholic beverages are permitted here. Reasonable accommodation, at cottages managed by Temple committee. is available at Badri. Postal and Banking facilities are also available.